A good education will help you achieve your career goals, but your degree comes with a staggering price tag—one that’ll definitely hit you with sticker shock. Consider this: In 2015, the average college debt at graduation ranged from $3,000 to $53,000. In 2015-2016, about 94% of undergraduate private student loans included a co-signer. While there are plenty of scholarship, grant, loan, and refinancing options available to college students, they’re not all easy to get. In some cases, you’ll simply be able to sign on the dotted line once your applications are approved. But in other cases, such as with private student loans, you might need a co-signer—a creditworthy individual who will be legally responsible for repayment should you default, become disabled, or die. If you’re just starting school and lack the steady income and solid credit history required for approval, a co-signer will help you clear the approval hurdle. And if you already have a student loan and that debt (and the interest that comes with it) is weighing you down, a co-signer can be your refinancing angel. In either situation, you’ll be in good company: In 2015-2016, about 94% of undergraduate private student loans included a co-signer , as did 61% of graduate private student loans . Before you jump in, though, make sure you understand the dos and don’ts of choosing—and removing—a student loan co-signer. When you apply for a private student loan or refinance, lenders check your financial fitness (credit score, debt-to-income ratio, etc.) to see if you qualify. At SoFi, one of the main things we look at is your “free cash” flow—the amount of money you have left at the end of each month after subtracting taxes and cost of living expenses. If you lack the necessary free cash flow to repay your loan, either your application will be declined or your loan will be approved at a less-than-desirable interest rate. If your cash flow is more of a trickle, the lender may prompt you to add a co-signer to your application. Don’t panic—it’s not a bad thing. Adding a co-signer doesn’t affect your credit report; it just helps you secure a loan at a better interest rate because the lender takes your co-signer’s financial situation into account, too. When considering the best co-signer, steer clear of asking your boyfriend or girlfriend. If the relationship goes south after signing, your ex will still be legally responsible for the loan. Would you want to be on the hook for the student loan payments of someone you’re no longer dating? Though anyone can co-sign a loan for you, a relative is a much better choice than a friend. In fact, the vast majority of student loan co-signers are parents and other close family members. Here’s a quick comparison: 45% of co-signers consented on behalf of a child or stepchild, while only 21% signed on the dotted line for a friend. A family member may think co-signing a loan is as simple as signing his or her name on a contract, but it’s more complicated than that. A co-signer is a co-borrower, which means the debt will show up on your credit report and on his or hers. Plus, if you can’t make good on your loan for any reason, the lender has the legal right to pursue your co-signer for repayment. It may be unpleasant, but it’s important to discuss worst-case scenarios with your co-signer. If you lose your job and can’t make payments, your co-signer must be prepared to assume full responsibility for the loan. Plus, you’ll need to discuss whether you’ll repay that person should he or she have to make payments at some point, or if those payments will be gifts. Note: Once you set clear expectations, it’s a good idea to sign a legal agreement together. Depending on your relationship, the agreement can be as simple as an email or as formal as a document drafted by a lawyer. If you think a legal agreement sounds drastic, keep in mind that a friendly co-signing situation can go sour when you don’t hold up your end of the deal. A 2016 CreditCards.com poll reveals that 38% of co-signers surveyed paid at least some money on a co-signed loan because the primary borrower failed to make payments. And 28% saw their credit score drop because the primary borrower paid late or not at all; and 26% said the co-signing experience hurt their relationship with the borrower. Word to the wise: Don’t make your co-signer regret doing you the favor. The fact is, your co-signer is taking a risk for you. You should feel confident in your ability to repay the loan fully on your own. Though it never hurts you to keep a co-signer, you can “offer release”—the official terminology for removing that person. Maybe your co-signer was happy to help you get approved, but after a certain amount of time wants out due to stress or even just a change of mind. Whatever the case, removing the co-signer means that person is no longer liable for your debt. If your intent in adding a co-signer was to get approved for a loan and qualify for a better interest rate—but you can now achieve both on your own—ask if he or she wants to be released from the obligation, and then take three easy steps to refinance. Not all lenders offer a co-signer release option—and those that do have stipulations for removal. Typically, you’ll need to make anywhere from 12 to 48 months of on-time, consecutive payments to qualify for co-signer release. Don’t make your co-signer regret doing you the favor. The lender will also look at your overall financial situation, including how well you’ve managed other debts. While the Consumer Financial Protection Bureau says the rejection rate for co-signer release applications is about 90% , some lenders say that rate is much lower. If you have a steady source of income, make all your payments on time, and are good at budgeting and saving, you’ll improve your chances of releasing your co-signer. Just remember that once your co-signer cushion is gone, you alone are responsible for the debt. Some lenders make the co-signer release process slow because it’s in their best interest to keep the loan co-signed. After all, removing a co-signer means the lender has one less person to pursue in the event of default. Typically, to remove a co-signer from a student loan, you’ll need to submit a request for release, along with supporting documents (proof of income, credit report, etc. ), and then wait for lender approval. At SoFi, however, you must reapply for the loan and see if you qualify on your own. Adding a co-signer to your student loan can truly work to your advantage, helping you qualify for a low-interest loan or refinance. So if someone in your life has offered to co-sign, consider it seriously—just make sure you both understand what you’re signing up for from the start. 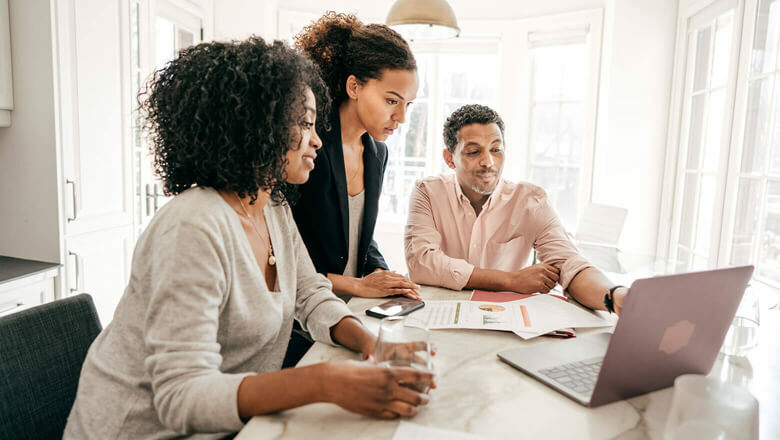 Check your rate for a student loan refinance, and share this article with someone else who should know the dos and don’ts of co-signing.